Over the past two decades we have seen an economic paradigm shift where more of the lower paying manufacturing jobs in the US moved to countries like Mexico, China and India and this is exactly what the Free Market predicted so this should not have been a surprise. The US should’ve seen this coming but we didn’t and now we are scrambling to quickly transition to a Knowledge Based Economy where more of the white collar jobs are located here and a smaller percentage of low paying blue collar jobs remain in the US . I have written about this here and won’t belabor the point in this post but I’d like to explore how we speed up that transition to a Knowledge Based Economy and equip our children to enter it. 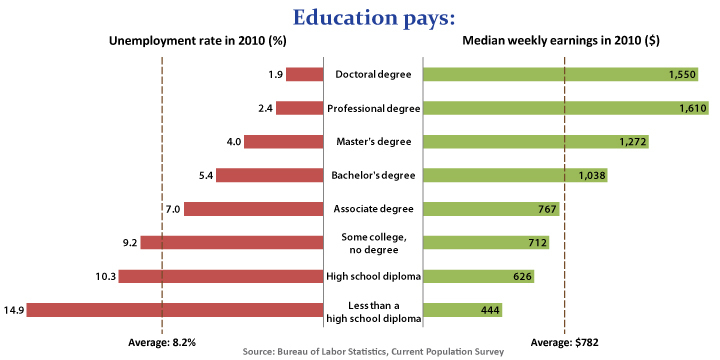 The Bureau of Labor Statistics published a chart showing how education level is related to Unemployment Rate and median weekly earnings. You can see that higher education results in higher median weekly earnings and the lower unemployment. This also should not be a surprise but it is even more important now since the US is not the center of manufacturing which employs low skilled labor. After looking at this BLS data, Education is the obvious area to focus our efforts. We must start with elementary education and continue through Middle School and High School to give our children the skills they need to equip them for further study in either technical schools or traditional colleges. From the BLS data, increasing the education level of our children will improve their quality of life and ensure that the US is still the leader in the world with regard to high technology and innovation. There was a paper published in the National Bureau of Economic Research (NBER) by Chetty, Friedman and Rockoff that provides insight into how we can better educate our children. The study looked at Value Added (VA) teachers and their effect on student test scores, college attendance, teen pregnancy and future earning potential. 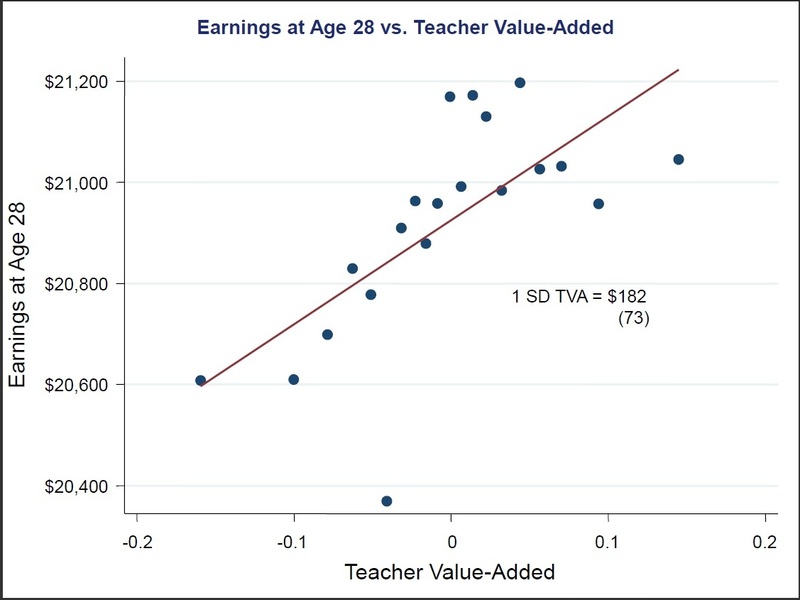 The term Value Added relates to evaluating teachers based on their ability to improve students’ scores on standardized tests (higher student test scores translates into a higher teacher VA score). There is much debate on the validity of this evaluation method and the question of whether students are really getting a better education versus performing to a standardized test has been raging for a long time. 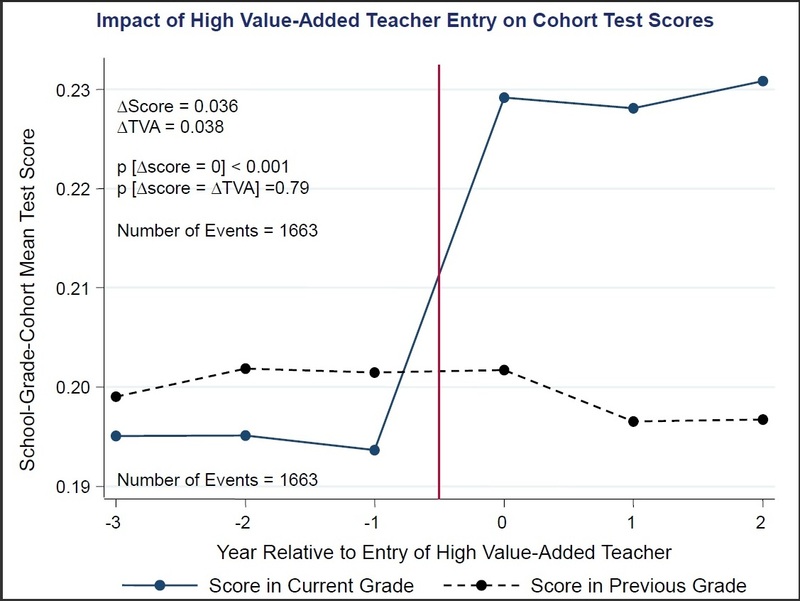 This paper concludes that teachers who have a high VA not only improve students’ test scores but provide them with an education to improve their quality of life in the future. This authors use two databases to derive their conclusions. The first is a dataset of test scores and teacher assignments for grades 3-8 from a large metropolitan school district (covering 2.5 million students and 18 million tests for math and English from 1989-2009) and the second dataset uses tax records from those students from 1996-2010. The paper is a long read and difficult if you don’t have a deep understanding of statistics but there is a summary of the main takeaways from this study here and a PowerPoint presentation here. When a high VA teacher enters a classroom (indicated by the red line on the following graph) the student test scores improve immediately. Students improve their future earnings when they are taught by a high VA teacher. When a low VA teacher (in bottom 5%) is replaced by a high VA, students dramatically improve their future earnings. 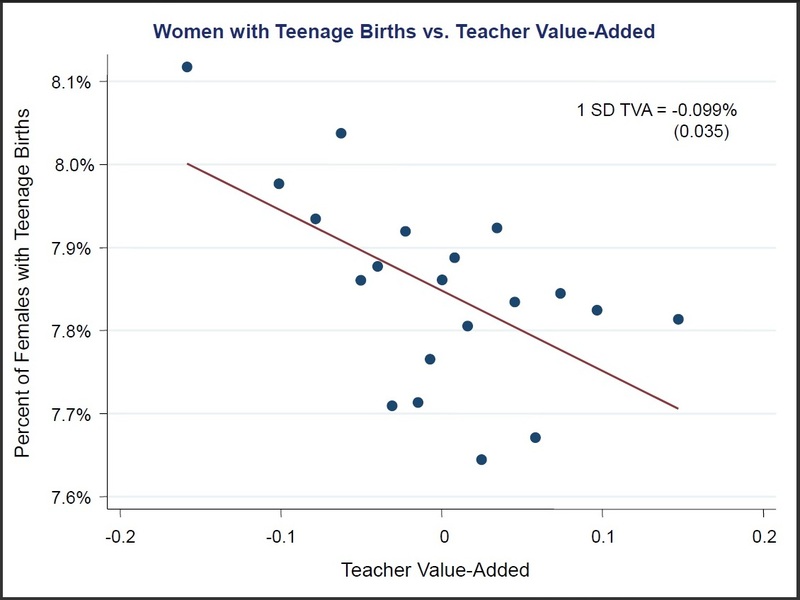 Women who have a high VA teacher experience lower rates of teenage births. 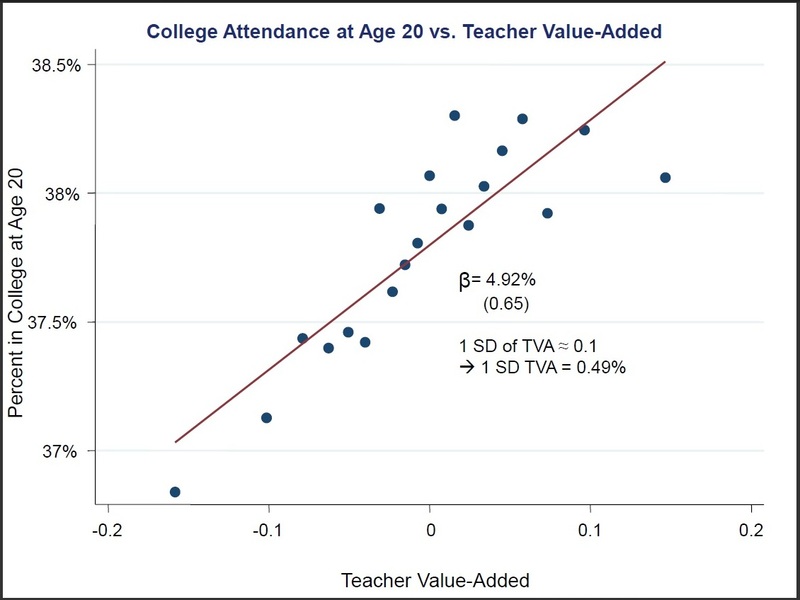 Students who have a high VA teacher have a higher percentage of college attendance at age 20. Disclaimer – As a parent of two children I will admit that teachers are not the only people who can influence the education of our children. Parents shoulder an equally large burden in this endeavor and must work with teachers to ensure their children are receiving the highest education possible. But here we have data showing that teacher quality directly translates to better student test scores, higher education attainment for the students, higher college attendance, fewer teen pregnancies and increased earning potential. This paper provides data that show teacher quality had a direct impact on our children’s’ education but we are still afraid to demand higher quality teachers and eliminate those who are underperformers. Wisconsin teachers are angry with Governor Scott Walker because he is eliminating collective bargaining with public sector unions (i.e. teachers) and they are calling for his recall. Governor Walker is merely stating that wage increases over inflation and benefits to teachers such as job guarantees for failing teachers should be decided by the voters and not politicians. Walker’s proposal gets to the heart of why public sector unions should not be allowed to collectively bargain with politicians – The taxpayers have no say in the agreement but yet they are the ones who pay the taxes and bear the burden of sweetheart deals negotiated between union bosses and politicians. 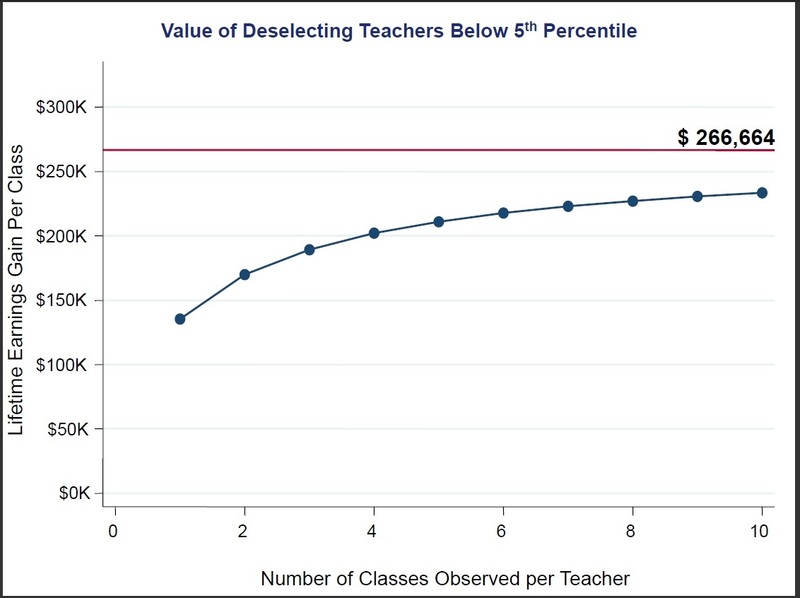 Education is truly the tide that can float all boats and with this compelling data from the NBER shouldn’t teachers and educators be more interested in finding the best qualified teachers instead of protecting those underperformers who are dragging us down? Instead of burning energy protesting a Governor who is trying to rein in costs in his state, why not attempt to improve teacher quality? Instead of griping about test preparation why not just teach the curriculum and ensure the students get the best education possible? The future of our country and our childrens’ quality of life are at stake and we don’t have time to play politics and protect underperforming teachers – we must address this issue now. Eliminate collective bargaining with public sector unions and demand that schools fire underperforming teachers and replace them with high VA teachers. Thanks for the positive exposure! In my opinion, there are a glut of college graduates who have gotten by on grade inflation and given degrees they simply paid for. This makes it nearly impossible to prove that you actually studied in college and know what you are talking about versus thousands of others who can show superficial credentials and get the job. Yes, but only if your professor is a Democrat. Republicans still give bad grades according to this post. You’ll like this!